I have some time, I’m making time, I am waiting for my wife. We escaped our small town today and ran away to the big city to shop, relax, eat, try and relax, eat, shop. Something tells me the relaxing part may not come to fruition but likely the others will. Once we arrived in Spokane our first stop was one of the largest malls in town, good planning or what. I knew it would be a good place to begin, the wife can limp around (another story) perusing all the sales etc. and I can scoot over to Barnes & Noble to look at books, and perhaps do some research. My current ‘interest’ you see is SEO, otherwise known as Search Engine Optimization. This interest in SEO maybe a fixation, will likely fade over time. Heck, it may be gone by the time I leave the store, but it is with me now and with me strong. Seemed the least I could do was write about it. It began when I read a post written by Lesley Carter at Bucket List Publications called “7 Great Ways to Improve Your Alexa Ratings”. I guess it really didn’t start there, but it was re-inspired when I read her numerous posts on ways to improve hits on your site and increasing your readers and followers. I don’t personally subscribe to that particular SEO service but I have taken part in Google’s Analytics and another service called HubSpot, a web marketing service. I don’t proclaim to know if one site is better than the next, you’ll have to do the research and find that out for yourself, but the concept is sound I think. If you can improve your site by making small changes, by increasing links or putting the name of your site out there on other sites it can only help. I am just touching on the very basics here and there is certainly much more to it than that. So this bring me full circle. 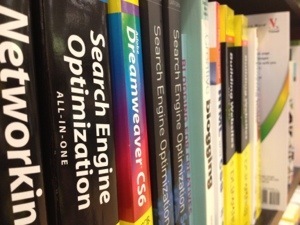 Here I am in Barnes & Noble, waiting for my wife and spending time searching the shelves for an appropriate book(s) on SEO. Unfortunately I quickly become overwhelmed. The sheer number of books (and the cost) takes the wind out of my sails and I rapidly decide I will endeavour to learn most of what I need to know by getting library books and reading free articles on-line. That’s not to say the books aren’t beneficial, only that for me, right now, they are too much and too soon. So, as the saying goes, if you can’t do something, you can write about it. Here I am, I came to write.